From the beginning, the landscape has determined where and how people live. Over time, people embellished the natural landscape with an infrastructure of roads, aqueducts, bridges, ports, power plants, and more. Now communities are turning their attention to the central planning challenge of our time: sustainability. And they are discovering, or rediscovering, the benefits of green infrastructure — infrastructure that takes advantage of the natural landscape. This well-grounded report shows how green infrastructure cleans the air and water, replenishes aquifers, reduces flooding, and moderates the climate. And the benefits go beyond improving the environment. Green infrastructure also promotes healthy exercise and access to more locally grown food. It makes communities safer and even helps reduce crime. It also boosts the economy as it attracts business, raises property values, and lowers energy and healthcare costs. 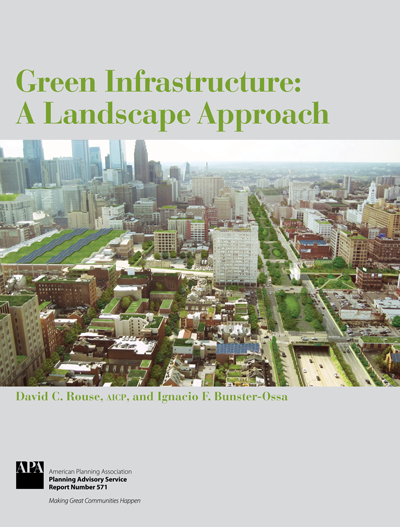 The authors, both practicing professionals in planning and design, present six principles for successful green infrastructure projects. Detailed case studies describe these principles at work from north Texas to southeastern Philadelphia to suburban Kansas. Planners, urban designers, and landscape architects will find proven ideas for making their regions, cities, and neighborhoods more resilient and sustainable.